Is it a sin that I have never seen any Roger Corman produced pictures? I think it might be. 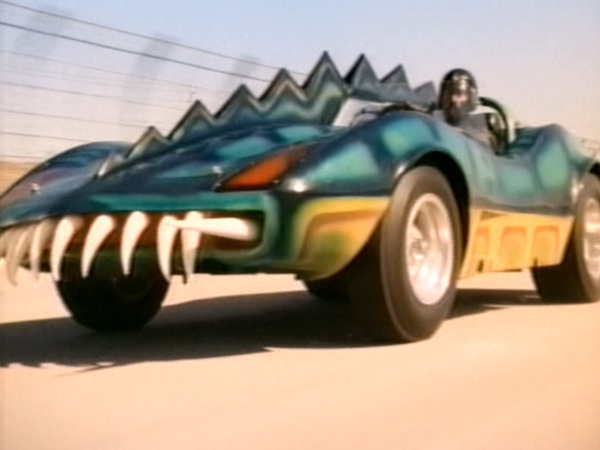 Allow me to correct that as soon as possible with Death Race 2000. One of the campiest movies I have seen in a long time. In the future, population is controlled by a cross-country car race to the death. Frankenstein (David Carradine), Machine Gun Joe Viterbo (Sylvester Stallone), Nero the Hero, Calamity Jane, Matilda the Hun all race themed cars and try to kill as many bystanders and innocents as possible. Babies, old people, and other car racers are not off the table and in fact are more points than regular Joes. However there is a group that does not like this philosophy. The Resistance is run by Thomasina Paine (a descendant of Thomas Paine) and plans to sabotage the race by setting up boobie traps for the racers as well as planting one of their own as a navigator for the most popular racers, Frankenstein (so named because he has had a ton of surgeries). But what the navigator doesn’t know is that Frankenstein is actually on their side. Will the Resistance kill Frankenstein before he puts his plan into action or will the navigator fall in love with Frankenstein and tell him all about their plan just in time to save him and let him go through with his plan that involves a grenade hand? Hint: it’s the last one. This is a silly movie. Beyond that silliness, it is a great movie full of campy thrills and chills. Tons of people get run over, some cars make a nosedive down some steep hills and there is a freaking grenade hand present throughout the last third of the movie. What more can you ask for? The answer is nothing. You can ask for nothing less or more. Click the button below to be subscribed to my blog. By clicking the button, you will receive me in your inbox every time I post. Who wouldn't want that?